Don't see what you are looking for? Add it to our wish list. Click here. 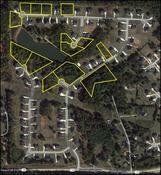 Access to sewer from entire site and a mandatory lift station installed off site by the prior landowner. Detention is also in place. 2,290 GA 136 Connector at W. Church St. The site is cleared/graded land formerly intended to include four retail/office/residential buildings and an amenity area across the street from the Duluth City Hall and adjacent to "Towne Park Place", a condominium structured development. There are 6 older, residential structures on the property that would need to be removed. Infrastructure is in place for the 92 lots. Approximately 1050 feet direct frontage on I-20, approximately 1300 feet on interstate exit ramp, and approximately 650 feet on U.S. 27. 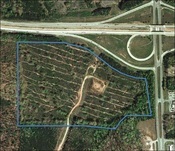 There is a power easement that runs the length of the site, parallel to Peachtree Industrial Boulevard. Sewer is across Brownsville Road at Kroger shopping center. Property is served by natural gas and electricity. Coweta County 12" water main at US Hwy. 29. 130± feet on N. Hairston Rd. Moderate topo with off-site detention. 28,300 ATD on N. Hairston Rd. 580± feet on Mountain Industrial Blvd. 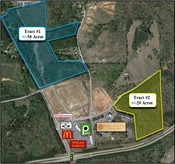 42,000 ADT on Mountain Industrial Blvd. 290± feet on Mountain Industrial Blvd. All utilities are available to the property. 40,300 ADT on Mountain Industrial Blvd. Sanitary sewer is available from the east side of Lenora Church Road approximately 500 ft. from subject property. 15,553 cars/day on Lenora Church Rd. Listing consists of 8 fully developed lots.